One thing I love about my job as a designer is how God often uses object lessons from my work to show me His nature. I have the privilege of working with clients as they undergo home renovations and remodels of all shapes and sizes. No matter the scope of the project, there are a number of phases they all seem to have in common. And there is one objective they share: transformation. But our homes aren’t the only things in our lives that need improvement, maintenance, updating (and sometimes an overhaul). We are all a work in progress! Luckily for us, God is a master builder, designer and creator. Sometimes, we begin the process of change because we crave it. We see an area that needs improvement and we want to work on it. Other times, change and transition happen involuntarily — ready or not. Regardless, throughout our lives the seasons are defined by periods of change. 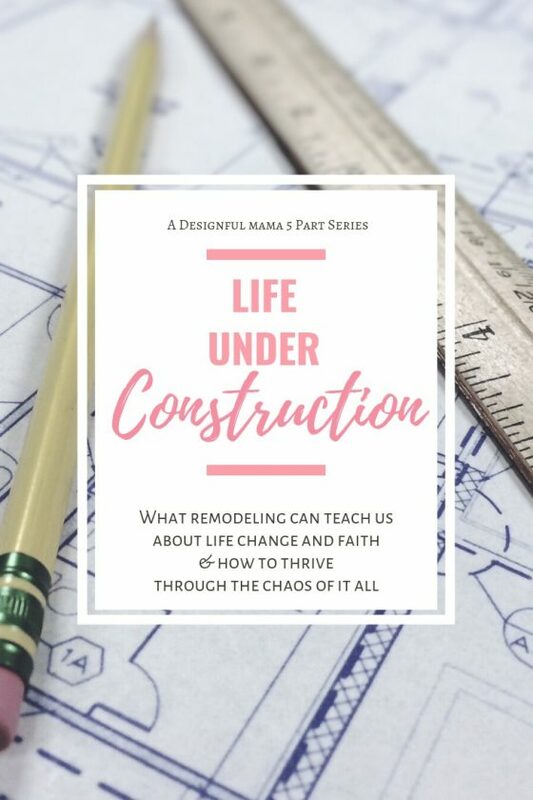 Through my experience with designing for remodels, I’ve learned the 5 phases of home improvement are the same ones we go through during life change and growth. What is our objective and what goals do we want to accomplish? What are our needs and priorities? What do we desire? What do we love? Why this project, why now? What do we imagine the end will result will be? What do we hope will be different? How will this change affect the way we live for the better? What resources will it require? What needs to happen for the project to be possible? What suppplies, what expertise, and at what cost? How long will it take? Who will provide the expertise? Who can we trust to execute the plan correctly? Often the scope of the project is dictated and defined by deadlines, resources and needs. And the driving force that gets things moving is the desire for change. We have to want (or need) the change more than we don’t want the pain of change. Right? The days that were ordained for me. Often in the midst of our circumstances we see what’s broken. We see what isn’t working and we want solutions. We look for inspiration for solutions all around us, but we are limited to what we can see and what we can conceive of in our own experience. On the other hand, a designer can look beyond the existing and see the potential. If we limit ourselves to what we think we want, we can miss out on huge potential we don’t even realize is there, potential for a solution better than we imagined, if we could just see it from another perspective. God doesn’t step in and see us as broken down, worn out, or ugly. He steps in and sees the potential in us. And it delights Him to have the opportunity to show us! Part of asking what’s possible involves determining what change a structure is capable of handling. What reinforcements or reframing may be needed to accommodate the change? What extra steps will be needed to make sure the structure will be strong enough to handle the change? Likewise, when our lives are in an overhaul, our General Contractor is an expert builder who will make sure we have the structural support to endure the change. Sometimes it means there are things that need to be done first to prepare us for change. And once those things happen, we find out we are a lot stronger than we realize. Planning means we begin with the end in mind. A good plan considers circumstances, attributes, conditions, needs and potential. A well-thought out plan provides the best outcome. The plan is the roadmap we follow that takes out the guesswork; it is the reference document for the entire project. The plan provides direction and clarity when confusion or disagreement arises. One of my favorite DIY shows is Holmes on Homes. Each episode is a story of a renovation gone wrong, due to contractors cutting corners and not adhering to the specifications, standards and procedures outlined in the plans and building codes. Enter Mike Holmes, who rescues the day by making it right. He shows it is never too late to correct course, even when the situation seems hopeless. Even when we get in the way of our own progress, the situation is never hopeless! We make mistakes along the way. We may not take a perfect road to our destination, but as long as we keep referring to the plans and placing our trust with the One who is trustworthy, our situation is never hopeless. And of course a set of plans includes contact information for the architect, designer and builder, so that they can be contacted for clarification at any time during the project. Thankfully, we have our Creator on speed-dial and He is available for questions 24/7! Join me tomorrow for Part 2 in the series, where we will discuss what is needed for BIG change!